Water loss may result from pure water loss, as seen with diabetes insipidus, elevated body temperature, primary hypodipsia, and water restriction. Alternatively, it may occur with loss of fluids that are hypotonic relative to plasma, such as with vomiting, diarrhea, third-space loss, burns, diabetes mellitus, mannitol, diuretics, kidney injury, or postobstructive diuresis. Fluid therapy is an essential component of the treatment plan for many hospitalized small animal patients. The choice of type and dose of fluid to use depends on the clinical status of the patient as well as available resources. Part 1 of this article, in the January/February 2018 issue, reviewed fluid distribution in the body, assessment of hydration, types of body fluid losses, types of fluids available, and calculation of fluid needs. This article focuses on fluid therapy in select cases of electrolyte abnormalities and fluid balance states, monitoring fluid therapy, and when and how to discontinue fluids. Sodium abnormalities are common in small animal practice. Measured serum sodium reflects the amount of sodium relative to water in the extracellular space and does not necessarily reflect total body sodium. With pure water loss, water moves down its concentration gradient from the relatively hypotonic intracellular space to the extracellular space. Consequently, there is a relatively proportional volume loss, with approximately two-thirds lost from the intracellular space and one-third lost from the extracellular space. As a result, intravascular volume depletion is uncommon with pure water loss. With hypotonic fluid loss, the water loss is not proportional, and both a greater reduction in extracellular fluid and a greater chance of intravascular volume depletion occur. As the tonicity of the fluid lost increases, the degree of hypovolemia increases. In cases of acute hypernatremia (<12 hours), sodium can be restored to baseline quickly; however, in most patients that present with hypernatremia, the duration of hypernatremia is unknown and must be presumed to be chronic. Because of the presence of idiogenic osmoles in patients with chronic hypernatremia, rapid restoration of a free water deficit (FWD) results in fluid shifts into the intracellular space and cerebral edema. It is therefore recommended that sodium be decreased by no more than 10 to 12 mEq/L over 24 hours (BOX 1). In cases of severe hypernatremia, this decrease may take days. In hypernatremic patients, the FWD should be replaced at a rate that reduces the sodium concentration (Na) by no more than 0.5 mEq/L per hour. Because the “normal” sodium concentration may vary depending on the analyzer used, this number may vary slightly between individual clinics. For example, if a patient weighs 20 kg and has a sodium concentration of 180 mEq/L, its FWD is 2.9 L.
If volume depletion is present, the extracellular volume should be restored with a fluid that has a sodium concentration similar to that of the patient’s plasma. If the patient’s sodium concentration is >160 mEq/L, custom fluids can be made by adding hypertonic saline to 0.9% saline to achieve the desired sodium concentration (BOX 2). If a patient’s sodium concentration is >160 mEq/L, a fluid that is isotonic relative to the patient’s plasma can be made by adding hypertonic saline (23.4% NaCl) to 0.9% saline. The amount of NaCl in 23.4% saline is 4 mEq/mL. The concentration of sodium in a liter bag of 0.9% NaCl varies slightly; the average is 154 mEq/L. It is helpful to measure the sodium concentration of any customized solutions on a point-of-care analyzer before administration. 26 mEq/L must be added to a 1-L bag of 0.9 NaCl to match the patient’s sodium concentration. 6.5 mL of 23.4% NaCl must be added to a 1-L bag of 0.9% NaCl for this patient. Free water can be provided enterally (voluntarily or via a feeding tube) or by administering 5% dextrose in water. If 0.45% NaCl is administered, half of the volume is free water; the other half is equal to giving 0.9% NaCl. During correction of FWD, the patient should also receive a maintenance rate of a fluid that is close to isotonic relative to its plasma. This may be 0.9% NaCl if the patient is mildly to moderately hypernatremic. If the patient is severely hypernatremic, a custom solution may be required. Frequent (approximately every 4 hours) monitoring of the sodium concentration is necessary to ensure that it is not decreased too quickly and to allow adjustments to the fluid therapy plan. Ongoing hypotonic or free water losses may require higher rates of free water be administered. In patients that are hypernatremic because of sodium gain, dilution of the extracellular fluid with free water will cause further expansion of the intravascular volume and may result in volume overload. Caution should be used in patients that are oliguric or have underlying cardiac disease. Frequent monitoring for signs of volume overload (BOX 3) is indicated. In patients that have mild hypernatremia with hypotonic fluid loss or decreased renal function and a decreased ability to excrete a salt load, 0.45% NaCl can be used as a maintenance fluid after volume depletion has been corrected. As with hypernatremia, hyponatremia is commonly considered chronic unless a recent baseline sodium measurement is available or the patient exhibits clinical signs to suggest an acute change. If hyponatremia is chronic, sodium should not be raised more than 10 to 12 mEq/L in a 24-hour period. A rapid correction of sodium may result in central pontine myelinolysis, in which neurons shrink away from the myelin sheath. Clinical signs of myelinolysis, such as lethargy, weakness, ataxia, hypermetria, and tetraparesis, occur several days after rapid sodium correction and can be treated with free water administration, although the damage may be irreversible. IV fluid choice should depend on the degree of hyponatremia. If the patient has no clinical signs and is normally hydrated, water restriction is indicated. In patients that have a sodium concentration <130 mEq/L and need IV fluids, the commercially available fluid with the lowest sodium, lactated Ringer’s solution (130 mEq/L), should be used. Sodium concentration should be measured at least every 4 hours during the beginning of therapy and adjustments to fluid made as needed. Typically, patients transition from solutions containing lower sodium concentrations (eg, lactated Ringer’s solution) to solutions with higher concentrations (eg, Plasmalyte-A [baxter.com]) as their sodium concentration slowly rises. In small animals, hypochloremia is commonly caused by gastrointestinal obstruction, but it can also be secondary to administration of loop and thiazide diuretics.1 Loss of chloride and concurrent hypovolemia result in retention of bicarbonate to maintain electroneutrality, and metabolic alkalosis will persist if the hypochloremia goes untreated. The fluid of choice to correct hypochloremia is 0.9% NaCl because it has the highest chloride concentration of the isotonic crystalloid solutions available. Once volume status has been corrected with 0.9% saline, the metabolic alkalosis will resolve. Hypokalemia is a common finding in small animal patients and may result from increased potassium loss through the gastrointestinal or urinary tract, decreased potassium intake, intracellular shifting of potassium due to alkalemia or insulin administration, catecholamine release, hyperaldosteronism, and administration of loop or thiazide diuretics.3 Hypokalemia can result in muscle weakness, cervical ventroflexion, rhabdomyolysis, hypoventilation, cardiac conduction abnormalities, and refractory hypomagnesemia. 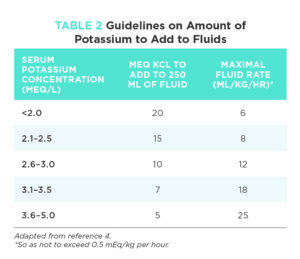 Although select cases may require higher supplementation, in most patients it is important that the total potassium administration rate not exceed 0.5 mEq/kg per hour because rapid fluctuations in potassium levels and hyperkalemia can precipitate cardiac arrhythmias. 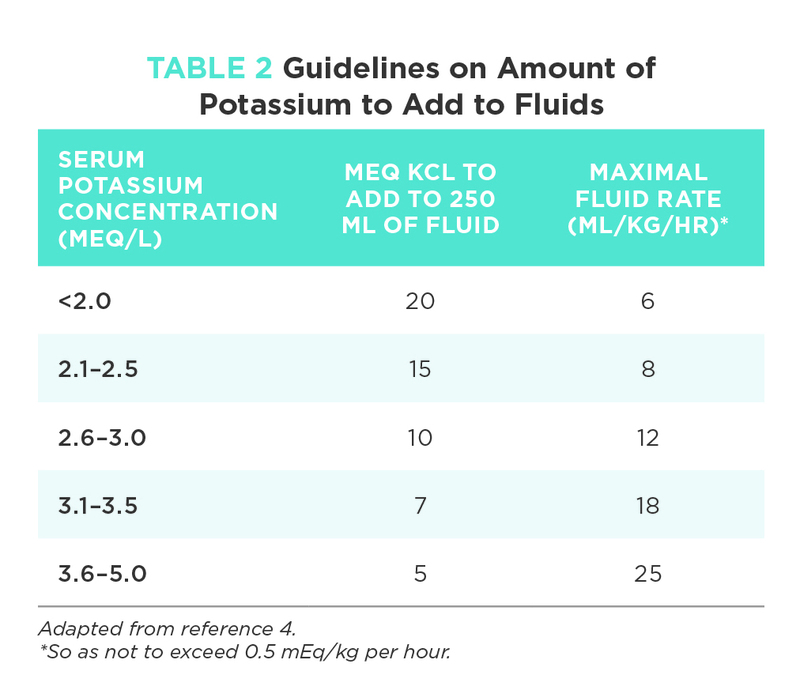 aSee TABLE 2 in “Fluid Therapy in Hospitalized Patients: Patient Assessment and Fluid Choices,” [TVP JanFeb18], for potassium concentrations of common fluids. Administration of fluids to patients with underlying cardiac disease is generally contraindicated; however, some of these patients cannot meet their fluid needs because of underlying comorbidities and/or anorexia. In patients that can tolerate enteral fluids but are unwilling to drink, a nasoesophageal, nasogastric, esophagostomy, or gastrostomy tube can be used to administer fluid. This can be particularly helpful in patients that develop azotemia secondary to diuretic administration but continue to require diuretic therapy. Fluid needs can be calculated in the same manner as IV fluids (ie, dehydration plus maintenance plus ongoing losses). In patients that cannot tolerate enteral water and have underlying cardiac disease but no overt heart failure, cautious IV fluid therapy may be instituted. Starting at low rates (eg, 1 mL/kg per hour) with diligent monitoring is recommended. Use of 0.45% saline can be considered because the higher amount of free water and lower sodium content theoretically has a lower risk of causing fluid overload. Patients with decreased urine output secondary to acute kidney injury, end-stage chronic kidney disease, or postrenal obstruction of the urinary tract are at high risk for hypervolemia and fluid overload. Patients that are dehydrated and oligoanuric may still benefit from IV fluid therapy, but low rates of fluid administration (1 to 2 mL/kg per hour) with close monitoring are recommended. Once the patient appears clinically euhydrated, discontinuation of IV fluids is recommended until adequate urine output can be restored because overhydration results in organ edema and dysfunction, in addition to pulmonary edema and worsening kidney injury. Patients with high urine output (>2 mL/kg per hour) often cannot meet their fluid demands through oral intake and require IV fluid support. Fluid therapy plans can be calculated in the same manner as in patients with a normal urine output, with special consideration for the “ongoing losses” part of the calculation. If a urinary collection system is in place, quantification of urine output is relatively simple. In patients without urinary catheters, use of absorbent pads or nonabsorbable litter to collect and weigh urine can facilitate measurement of urine output (1 mL of urine weighs approximately 1 g). Patients with postobstructive diuresis frequently need high fluid rates that exceed what appears to be appropriate to meet ongoing urinary losses. Clinicians should not be dissuaded from providing these patients with the amount of fluid calculated. Close monitoring for both fluid overload and underload is needed. Once the patient appears to be euhydrated, adjustment of the fluid rate every 2 hours based on the urine output (sometimes called “matching ins and outs”) can be used to ensure that the patient’s fluid needs are met. Monitoring is an essential component of fluid therapy, and patients receiving IV fluids should be reassessed several times a day to determine whether the fluid plan needs to be altered. The patient should be weighed at least once daily and have at least 2 physical examinations per day to assess intravascular volume and hydration status. The examination should include cardiothoracic auscultation, evaluation of interstitial hydration, mucous membrane color and capillary refill time, and pulse quality. In patients that have more dynamic or challenging fluid needs, more frequent assessments of body weight and physical examination (up to every 4 to 6 hours) may be required. Serial monitoring of respiratory rate and effort is required because one of the first signs of pulmonary edema is an increase in both. FIGURE 4. 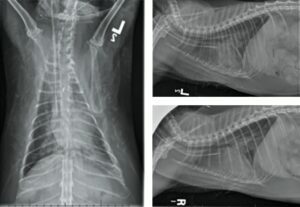 Three-view thoracic radiographs of a cat with fluid overload. Note the tall cardiac silhouette, enlarged pulmonary vessels, bilateral pleural effusion, and generalized interstitial pattern with patchy alveolar infiltrates in the perihilar region and right cranial, right middle, left cranial, and left caudal lungs. An esophageal feeding tube and central venous dialysis catheter are also present. Clinical signs of fluid overload include those listed in BOX 3. In dogs, thoracic radiographs can show an interstitial-to-alveolar pattern in the perihilar region or caudodorsal lung fields; this pattern may be more diffuse in cats (FIGURE 4). Left atrial enlargement and enlargement of the pulmonary vasculature can accompany these changes. If cage-side ultrasonography is available, serial monitoring of left atrial size can be extremely useful in identifying pending fluid overload before the onset of clinical signs. In addition, electrolytes such as sodium, potassium, and chloride should be checked at least once daily in stable patients, and more frequently if indicated by patient stability or electrolyte fluctuations. If available, point-of-care panels that include electrolytes and acid–base status are useful because acid–base abnormalities are frequently concurrent with other abnormalities and electrolyte disorders that require fluid therapy. Determination of when to discontinue fluids is based on the patient’s individual needs. Patients that begin eating and drinking can have their fluids tapered, which involves a gradual decrease of hourly fluid rate over 24 to 48 hours to ensure that they can maintain hydration without further intervention. Patients that receive high rates of IV fluids may experience renal medullary washout, which impairs urine concentrating ability for several days after fluids are discontinued, so abrupt discontinuation is not recommended.7 Medullary washout is of greatest concern in patients that are undergoing postobstructive diuresis or are receiving high rates of IV fluids for other reasons (eg, conversion of anuria to polyuria). The duration of a fluid taper in these patients may last between 2 and 5 days. Once the decision has been made to taper IV fluids, the fluid rate can be decreased by 10% to 20%. The patient’s weight and hydration status should be monitored carefully to ensure the patient can compensate for this reduction in fluid rate. If the reduction is tolerated, the fluids can be decreased by an additional 10% to 20% in 6 to 12 hours, then continue to be similarly decreased every 6 to 12 hours until they are discontinued. In patients that are not drinking enough to compensate for fluid losses, IV fluids may need to be transitioned to enteral water via a feeding tube or SC fluids, depending on the primary disease process. Patients that begin eating and drinking can have their fluids tapered, which involves a gradual decrease of hourly fluid rate over 24 to 48 hours to ensure that they can maintain hydration without further intervention. Patients that receive high rates of IV fluids may experience renal medullary washout, which impairs urine concentrating ability for several days after fluids are discontinued, so abrupt discontinuation is not recommended. 1. DiBartola SP. Disorders of sodium and water: hypernatremia and hyponatremia. In: DiBartola SP, ed. Fluid, Electrolyte, and Acid-Base Disorders in Small Animal Practice. 3rd ed. St Louis, MO: Elsevier; 2006:47-79. Burkitt Creedon JM. Sodium disorders. In: Silverstein DC, Hopper K, eds. Small Animal Critical Care Medicine. 2nd ed. St. Louis. MO: Elsevier; 2015:263-268. DiBartola SP, de Morais HA. Disorders of potassium: hypokalemia and hyperkalemia. In: DiBartola SP, ed. Fluid, Electrolyte, and Acid-Base Disorders in Small Animal Practice. 3rd ed. St Louis, MO: Elsevier; 2006:91-121. Greene RW, Scott RC. Lower urinary tract disease. In: Ettinger SJ, ed. Textbook of Veterinary Internal Medicine. Philadelphia: WB Saunders; 1975: 1572. Hughes D, Boag A. Fluid therapy with macromolecular plasma volume expanders. In: DiBartola SP, ed. Fluid, Electrolyte, and Acid-Base Disorders in Small Animal Practice. 3rd ed. St Louis, MO: Elsevier; 2006:647-664. Woodcock TE, Woodcock TM. Revised Starling equation and the glycocalyx model of transvascular fluid exchange: an improved paradigm for prescribing intravenous fluid therapy. Br J Anaesthes 2012;108(3):384-394. Silverstein DC, Santoro-Beer K. Daily intravenous fluid therapy. In: Silverstein DC, Hopper K, eds. Small Animal Critical Care Medicine. 2nd ed. St. Louis. MO: Elsevier; 2015:316-320. Bridget M. Lyons, VMD, is a resident in emergency and critical care at the University of Pennsylvania. She graduated from the University of Pennsylvania School of Veterinary Medicine and completed a small animal rotating internship at the Animal Medical Center. Her research interests include sepsis and the role of the microbiome in critical illness. Lori S. Waddell, DVM, DACVECC, is clinical professor of critical care medicine at the University of Pennsylvania, working in the intensive care unit. She graduated from Cornell University’s College of Veterinary Medicine and completed an internship at Angell Memorial Animal Hospital in Boston, Massachusetts. After her internship, she briefly worked as an emergency clinician in private practice before completing a residency in emergency and critical care at the University of Pennsylvania’s Veterinary Hospital. Her current areas of interest include fluid therapy, acid–base disturbances, and coagulation in critically ill patients.